As seen from the images, the Galaxy A90 will have the pop-up selfie camera at the top edge. The handset is said to have an all-display fascia with no bezels or a notch; however, there’s a noticeable chin. It’ll be interesting to see how far the phone can push the screen-to-body aspect ratio with that setup. Meanwhile, the impression of a fingerprint at the bottom half of the screen indicates an on-screen fingerprint sensor. It has been rumoured to come to Galaxy A90 and its siblings Galaxy A50 and Galaxy A70. 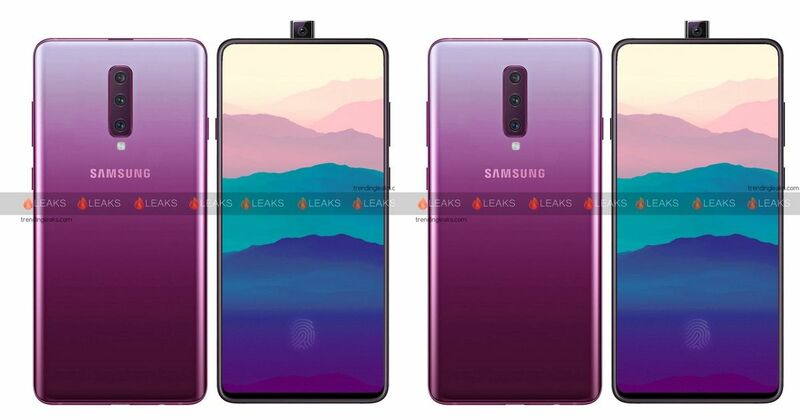 Moving on to the rear, the renders reveal Galaxy A90 with gradient finish and purple shade. A triple rear camera module vertically-aligned at the center with LED flash and ‘Samsung’ branding just below. The left edge of the phone will reportedly flaunt Bixby button, while on the opposite edge, you’re likely to get power button and volume rocker. The specifications of the handset remain as much of a mystery as its launch date at the moment. However, rumours are Galaxy A90 could see the light of the day in April/ May 2019 along with its other siblings. Samsung is reported to launch as many as nine Galaxy A series smartphones this year. The offerings, namely Galaxy A10, A20, A30, A50, and A70, have been on and off the leaks over the past few months.